Feeding both cows and calves a small amount of the supplement or weaning ration prior to weaning, in the weaning pen or pasture can be used help acclimate calves to both the feeds and the environment. A recently published K-State study (Bailey et al., 2016) evaluated the proportion of calves observed at feed bunks immediately after feed delivery for 6 days after arrival at the K-State Agriculture Research Center feed lot in Hays, KS (Figure 1). The calves in this study had been: 1) weaned and preconditioned in a drylot for 28 d (Drylot), 2) weaned and preconditioned on pasture for 28 d (Pasture) or 3) weaned and precondition on pasture for 28 d with a supplement fed 3 times per week at a rate of 1% of calf bodyweight in portable bunks (Pasture + Supp). The results of this study indicate that previous exposure to a feed bunk matters. The greatest number of calves reported at the bunk for the first 5 days following feedlot arrival was observed in calves that had been weaned and preconditioned in a drylot, followed by calves that were fed supplement on pasture in portable feed bunks and was lowest among calves that had essentially no exposure to feed bunks. In addition, average daily gain for the first 30 days followed a similar pattern which indicates that previous exposure may have also impacted calf performance during feedlot receiving. The second step in managing feed intake of newly weaned calves is transitioning the calf from a diet of mother’s milk and grazed forage to grazed forage and supplement, hay and supplement, or a ration containing novel feeds. Feed intake of weaned calves is often low (1.0 to 1.5 % of bodyweight, dry basis) immediately following weaning. Calves also have relatively high nutrient requirements. Thus, the weaning diet must be nutrient dense to meet the nutrient requirements of the calves at the expected intakes previously mentioned. Unfortunately, the dry feeds calves are often most familiar with (typically grass hays) are not necessarily nutrient dense. 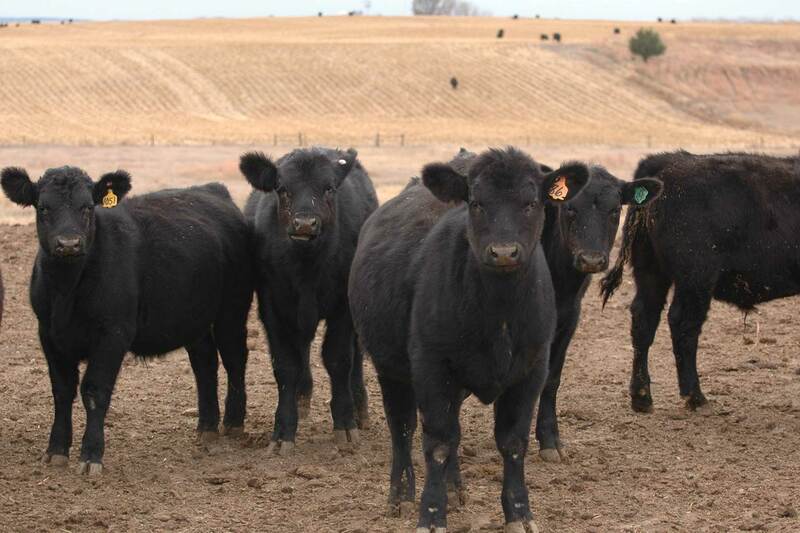 At the K-State Agriculture Research Center, Hays, KS a feeding management protocol for weaning calves has been developed that works well for transitioning weaned calves to a total mixed ration. The protocol is summarized in Table 1. Essentially, high-quality grass hay and the weaning ration are offered each at 0.5% of the calves’ current bodyweight, dry basis, on the day of weaning. The weaning ration is placed in the bottom of the bunk and the hay is placed on top. The amount the weaning ration is steadily increased, while the amount of hay offered remains constant. In addition, on day 4 the hay is placed on the bottom of the bunk. Over a period of 7-10 days the dry intake of the calves is steadily increased and should reach approximately 2.2-2.5% of the calves’ bodyweight by 10-14 days following weaning. Weaning calves is a necessary component of the beef production cycle and although it has its challenges it is also our opportunity as cattle producers to prepare calves for the next phase of the beef production cycle. Effectively preparing calves to consume novel feedstuffs from a bunk is an essential part of the process and research indicates that a little preparation and planning can go a long way. Bailey, E. A., J. R. Jaeger, J. W. Waggoner, G. W. Preedy, L. A. Pacheco, and K.C. Olson. 2016. Effect of fence-line or drylot weaning on the health and performance of beef calves during weaning, receiving and finishing. Prof. Anim. Sci. 32:220-228.